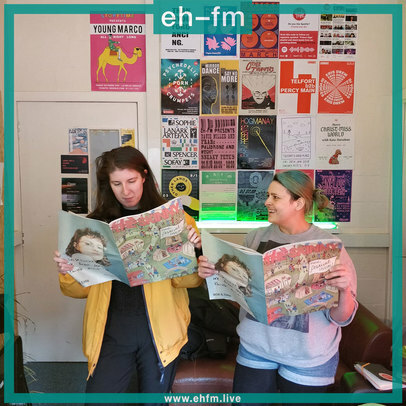 We – Tallah Brash (Music Editor) and Nadia Younes (Clubs Editor) – were back on the radio today (8 Apr) for our fourth show on Edinburgh community station EH-FM. Our show happens every Monday from 12-2pm and is your go-to guide for what's on that week in the world of gigs and clubs across Scotland; listen back to our latest show in the below Mixcloud player which included a chat with Emily Smith and Owen McAllister, aka Chuchoter, about the release of their latest single U Can Find and their upcoming appearance at Wide Days on Friday 12 April. We also featured a guide to Record Store Day, had our usual gig guide, new music and music news chat, got well relaxed in our Don't Speak section and well retro in our Clubs section. Daft banter as per. We were also hoping to play G.H.O.S.T by Parisienne experimental producer Nodey as well but we sadly ran out of time, so as promised, here's the single's completely outlandish, bizarre, stunning and explicit video, directed by Chen Tianzhuo, for your viewing and listening pleasure.